1. Login to Google Calendar account. 2. Click on Settings link at top right part. 3. Then click on Labs tab on the settings page. 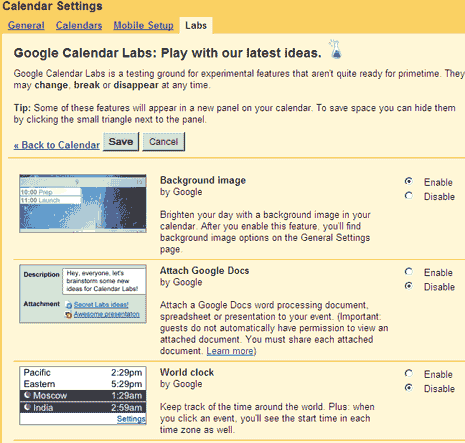 Currently it has 6 different labs features which can be used on your Google Calendar. For example, you can add background image to your calendar. You can attach Google Docs word processing document, spreadsheet or presentation to your event (that document must be shared). There is a feature to add World Clock on the sidebar to keep track of the time around the world. Test drive these Google Calendar labs feature and add something new and interesting to your Google Calendar. I’d like to be able to designate other cities on the world clock. For example, the time in Glascow, Scotland is the same as the time in London, but being Scottish, I’d like to option of seeing Glascow time on my calendar. When was it published ? Today is 08/18/2009 and the calendar background doesn’t let me add a local file… so am I supposed to upload it to somewhere else on the web and use that url ? You need to upload calendar background image somewhere else and add that image URL. There is no option to upload image directly.